When modifying a pickup truck or SUV to lift or lower the suspension, the geometry of how it performs can be greatly affected. One of the components we were able to utilize in maintaining this pickup truck’s suspensions geometry was a Pro Comp suspension lower cradle drop. 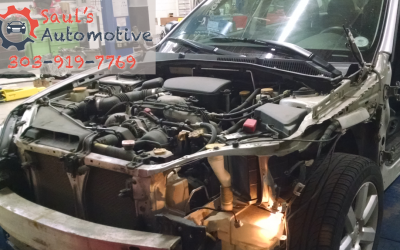 Part of the reason repairs on some import motor vehicles can be so costly is because of the labor involved. Now, many people often ask why does this car take more time than this car? They’re basically the same design. Unfortunately, a lot of the time, they’re really not. Good morning, I’m Saul Riesman here at Saul’s Automotive. Today we’re standing underneath a 1977 Chrysler New Yorker 440 Big Block Six-Pack. This was one of the original fastest rear-wheel drive true boat sedans that still survived. We’re back with our Cadillac Coupe de Ville. This vehicle came in with the goal of fitting a 28-inch wheel, which means pretty extensive suspension modifications. If your Jeep’s steering seems to shake, and your entire jeep seems to wobble from the front axle violently oscillating, you might be experiencing what some Jeep owners call the “Death Wobble”.